Last December I posted a Christmas tree retrospective. The 2013 entry in that lineup was our lavender bush, which I neglected to put back out on the porch before departing for our Berlin/Barcelona winter holiday family extravaganza. The housekeeper watered it, but the poor thing was all sticks and sachet stuffing by the time we got back in January. I didn’t feel like killing any plants this year so I took up an idea a friend sent me and made a book tree. I decorated it with the surprisingly robust assortment of book-related ornaments I have with me in Addis, topping it off with my Nancy Pearl librarian action figure (with magic shushing action!). That left several empty bookshelves to put the rest of my Christmas decorations on. Alekka and I have only a short time left in which to enjoy our Addis holiday decor. The 1.6 days of music on my Christmas iTunes playlist is just enough to last us until we take off for our 2014 holiday expedition to Dubai, France, and southern Ethiopia. Three continents in three weeks! I’ll be posting pictures. 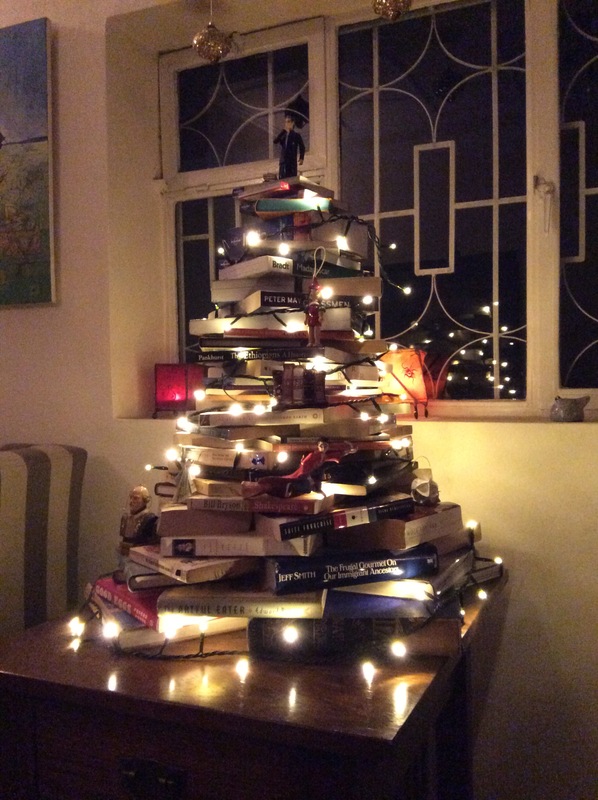 This entry was posted in Books, Expat experience, Home life and tagged book tree, Christmas, Christmas tree. Bookmark the permalink. Now that is a beautiful Christmas “tree”! Perfect topper, too! I hope you have a Merry Christmas. I forgot you had the librarian action figure. cool. Oh my goodness I know it’s well past Christmas but now I’m excited for Xmas 2015! I’m definitely putting up a book tree!! A Christmas Carol will definitely comprise part of it.